The DRI-DC-LA is a DIN rail mount, DC voltage or current input limit alarm with dual setpoints and two contact closure outputs. 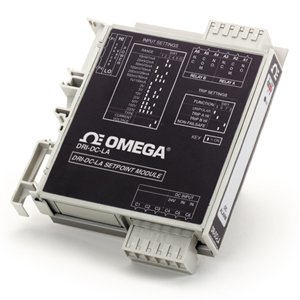 The field configurable input and alarm functions offer flexible setpoint capability. Input voltage spans from 10 mV to 200 V and input current spans from 1 mA to 100 mA can be field configured. Bipolar inputs are also accepted. The DRI-DC-LA is configurable as a single or dual setpoint alarm, with HI or LO trips and failsafe or non-failsafe operation. Also included are adjustable deadbands (up to 100% of full scale input) for each setpoint, a 24 Vdc voltage source (isolated from line power) for transducer excitation, and a universal AC power supply which accepts any voltage between 85 and 265 Vac. The DRI-DC-LA has simplified setpoint calibration. Using a pushbutton instead of potentiometers, improvements in calibration resolution and reliability are realized due to the elimination of the potentiometers’ mechanical variability. For calibration, simply input the signal level of the desired trip and press the pushbutton to store it in non-volatile memory. Deadband is entered the same way with another pushbutton press to store. The DRI-DC-LA is equipped with three front panel LEDs. The green LED is a dual function LED labeled IN, which indicates line power and input signal status. Active AC power is indicated by the illuminated LED. If this LED is off, check AC power and wiring connections. If the input signal is 7% above or below the configured input range the green LED will flash at 8 Hz or 4 Hz, respectively. The two red LEDs indicate the relay state of each setpoint. An illuminated red LED indicates the tripped condition for the respective setpoint. The DRI-DC-LA is equipped with two SPDT (form C) relays, rated at 120 Vac or 28 Vdc at 5 A. Each of these relays is independently controlled by the field configurable setpoint and deadband. The DRI-DC-LA limit alarm setpoints can be configured for HI or LO, failsafe or non-failsafe operation. Each of the setpoints has a respective HI or LO deadband. In a tripped condition, the setpoint is exceeded and the appropriate red LED will illuminate. The trip will reset only after the process falls below the HI deadband or rises above the low deadband. For proper deadband operation, the HI setpoint must be set above the LO setpoint. In failsafe operation, the relay is energized when the process is below the HI setpoint or above the LO setpoint (opposite for nonfailsafe). In the failsafe mode, a power failure results in an alarm state output. Circuitry in the DRI-DC-LA prevents false trips by repeatedly sampling the input. The input must be beyond the setpoint for 100 milliseconds, uninterrupted, to qualify as a valid trip condition. Likewise, the input must fall outside the deadband and remain there for 100 milliseconds to return the alarm to an untripped condition. This results in a “dynamic deadband” —based on time— in addition to the normal deadband. When switching inductive loads, maximum relay life and transient EMI suppression is achieved by using external protection. Place all protection devices directly across the load and minimize lead lengths. For AC inductive loads, place a properly rated MOV across the load in parallel with a series RC snubber. Use a 0.01 to 0.1 mF pulse film capacitor (foil polypropylene recommended) of sufficient voltage, and a 47 Ω, ½ W carbon resistor. For DC inductive loads, place a diode across the load (PRV > DC supply, 1N4006 recommended) with (+) to cathode and (-) to anode (the RC snubber is an optional enhancement).